Super typhoons (STYs), intense tropical cyclones of the western North Pacific, rank among the most destructive natural hazards globally. The violent winds of these storms induce deep mixing of the upper ocean, resulting in strong sea surface cooling and making STYs highly sensitive to ocean density stratification. Although a few studies examined the potential impacts of changes in ocean thermal structure on future tropical cyclones, they did not take into account changes in near-surface salinity. 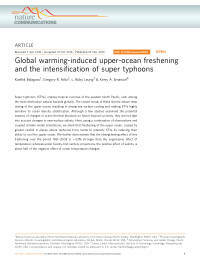 Here, using a combination of observations and coupled climate model simulations, we show that freshening of the upper ocean, caused by greater rainfall in places where typhoons form, tends to intensify STYs by reducing their ability to cool the upper ocean. We further demonstrate that the strengthening effect of this freshening over the period 1961–2008 is ∼53% stronger than the suppressive effect of temperature, whereas under twenty-first century projections, the positive effect of salinity is about half of the negative effect of ocean temperature changes.